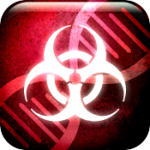 Ndemic Creations’ Plague Inc. ($0.99) is one of those games I never imagined would hook me like it has. It’s a strategy title that sees you unleashing a plague on the world and then managing how best to make it spread and annihilate the human population before scientists are able to wise up and find a cure for it. 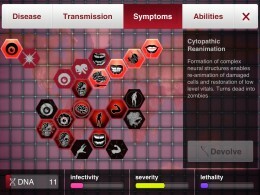 With a ton of different plague types, each with their own modification trees to explore and strategies to utilize, Plague Inc. is a highly satisfying and cerebral affair. Since its original release and our review from mid-2012, the game has been updated extensively adding even more content and strategies to the mix. We even talked with the developer who revealed a ton of interesting facts behind Plague Inc. which turned out to be one of our most popular stories of the year. 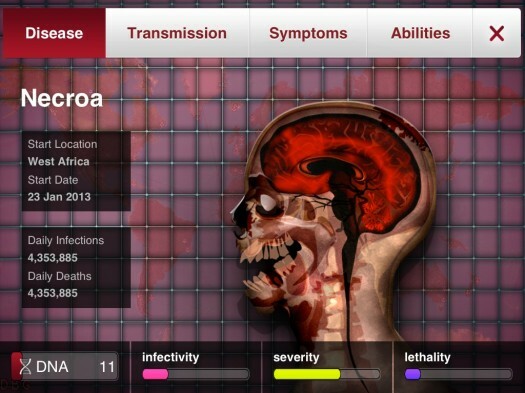 Today, Ndemic has sent over the details of the new upcoming update for Plague Inc. which adds a new virus to the game. 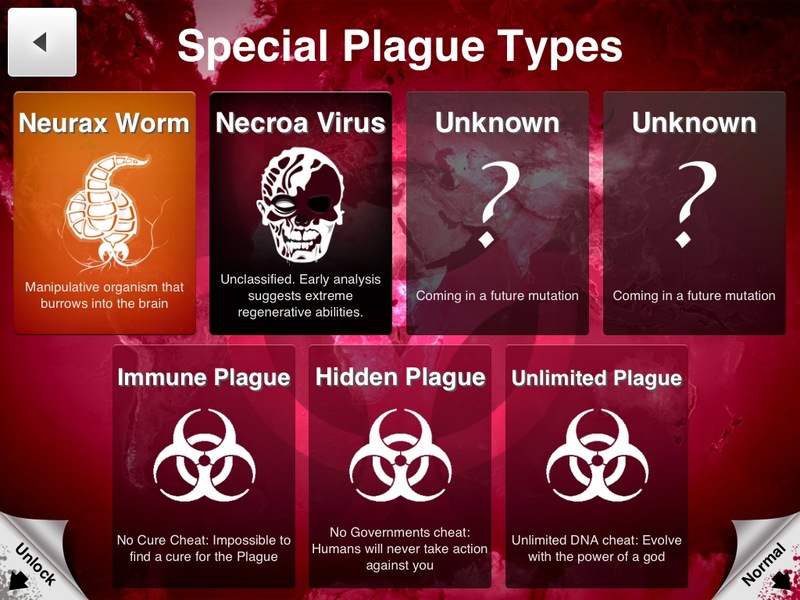 It’s called the Necroa Virus and at first blush seems pretty similar to the other plagues you can unleash in the game in the way it behaves. However, there is one branch of mutation that will enable it to reanimate the humans that it’s killed, thus turning them into zombies. From here a whole bunch of cool stuff happens. A new population category appears, so you’re now keeping your eye on who is healthy, infected, dead and who is a zombie. Once zombies are unleashed on the world they’ll begin attacking and infecting the healthy humans, and at this point a “cure" doesn’t do a whole lot of good. So humanity fights back. A new organization of zombie hunters called Z Com will popup around the world and need to be dealt with if you hope to wipe out humanity. There’s also a new mechanic called Active Abilities which will allow you to directly control specific regions of zombies to attack the living population, and even reanimate fallen zombies. 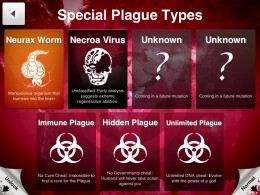 The Necroa Virus comes with 5 new genes for additional customization options, as well as new algorithms, evolution options, government responses, events and more that make it feel unlike any other plague before it. Like the previous Neurax Worm expansion, the Necroa Virus will be available as a $1.99 IAP or unlocked for free if you’re able to complete the game on the brutal difficulty. If you can do that, you are good, my friend. The upcoming update will also feature some new things that apply to everyone even if they choose not to get the Necroa Virus. These include new events and achievements, some UI fixes to make the game easier to play, and general tweaks and fixes. Oh, and since people seem to love hearing about cool Plague Inc. factoids, here’s a few on how well the game did in 2012. It was the 15th most popular paid iPhone game and 18th most popular paid iPad game overall for the year, and 76th top grossing game during that same time. And the Neurax Worm expansion pack? That thing was pretty popular too, and has been played over 5 million times since its release last September. The Necroa Virus update is set to launch sometime next month, so check out the Plague Inc. discussion in our forums and we’ll be sure to let you know when it hits.